I love going out for a big dinner, but there’s something extra comforting and cozy about setting the table, lighting a few candles, and enjoying a meal in your own home. My husband and I try to have a "date-night-in" periodically. They can be a little easier to pull off when the budget or babysitting logistics add an extra challenge to going out. Or, let's be honest...sometimes I just want to eat dinner in my sweatpants (romantic, right?). Sometimes we order out from a favorite restaurant, other days we cook a special meal outside our normal dinner rotation, or we combine a bit of both - like takeout for dinner and then a homemade dessert. This recipe for Roasted Pears with Buttery Chocolate Sauce + Smoked Sea Salt is the perfect addition to any date-night-in menu. It’s warm, sweet, and irresistibly decadent. Add toasted hazelnuts for a bit of crunch and finish the dish with a hint of smoked salt. It’s a combination of flavors worthy of any special occasion. Are you a fan of doing date nights in? Do you have any favorite date-night-in recipes? I'd love to hear in the comments below! Brush the cut side of the pears with the melted butter, and sprinkle the sugar evenly over the buttered side of the pears (about ½ a teaspoon of sugar per pear half). Roast for about 30 minutes, or until the pears are slightly browned. 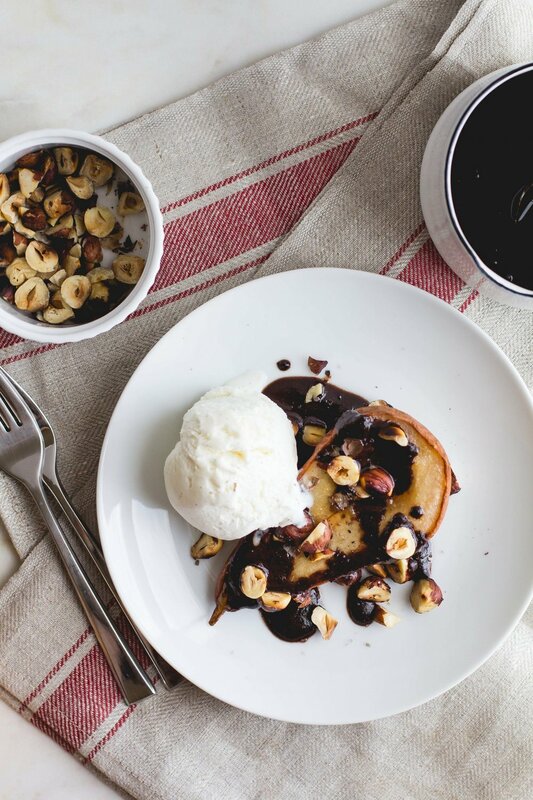 While the pears are roasting, make the chocolate sauce (see recipe below), and toast the hazelnuts. To toast the hazelnuts, add them to a small pan on the stove over medium-high heat. Stir or shake frequently for about 5-7 minutes, until the nuts are fragrant and slightly browned. Remove from heat and let the nuts cool enough to handle. If you like, you can rub the skins off the hazelnuts with a dish towel (I personally don’t mind leaving a bit of the skins on). Roughly chop the nuts and set aside until the pears are ready. When the pears have finished roasting, transfer them to individual plates and drizzle with the chocolate sauce. Top with the chopped, toasted hazelnuts and a pinch of smoked sea salt. Serve with vanilla bean ice cream, if desired. Enjoy! *You can substitute regular sea salt, but the flavor of smoked sea salt definitely takes this dessert up a notch. Add the chocolate, cream, butter, and salt to a small saucepan. Heat very gently over low heat, stirring constantly, until the chocolate and butter are melted and the ingredients are fully mixed. Remove from heat and set aside until you’re ready to use. Note: This sauce is meant to be served very warm. If you make it in advance and the sauce cools completely, the chocolate and butter will separate and harden. You’ll just need to rewarm it before serving. This recipe was originally featured at Lark + Linen.